After the numerous rumours about the camera phone, Nokia EOS, the company has now nearly confirmed about the device. 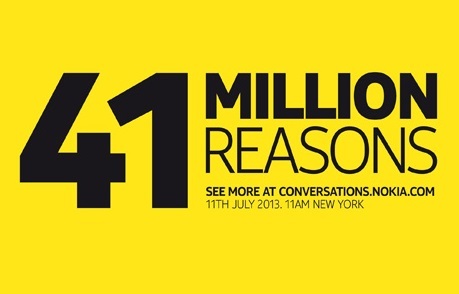 In a new post from Nokia In regards to the July 11th event scheduled to be held in New York, the company has mentioned “41 Million Reasons” thus hinting towards the 41 MP windows phone which will be unveiled at the event. The Nokia EOS is said to have a 4.5 inch display with 768 x 1280 pixel resolution. The phone powered by Windows Phone OS will feature a massive 41 MP camera, just like the one seen in the Nokia 808 PureView. The device would also have a 2000 mAh battery. So it’s just a matter of weeks before the new Nokia camera phone goes official. We will be covering it live from New York. Keep following us for more updates.